A brand new bus tour called Shakespeare’s London is now available for schools and will allow pupils to explore Shakespearean London. 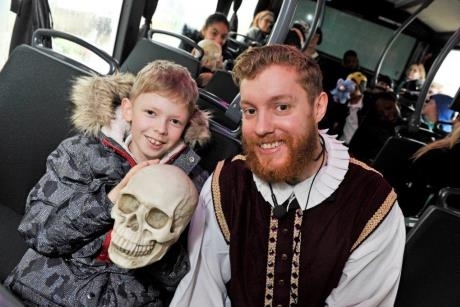 The bus tour, launched by sightseeing company Golden Tours, will take Key Stage 2 and 3 pupils around London to explore what life was like during Shakespearian times. The multisensory experience includes character guides in full Shakespearian costumes, sounds and smells from the aforementioned period, a chance to feel the fabrics worn by different communities of the Elizabethan society, and in-depth details about the Gunpowder Plot along with other topics. In addition, each pupil on the bus will receive a workbook that summarises relevant facts and provides activities aimed at enhancing the learning experience. The tour starts and finishes near Shakespeare’s Globe after passing outside Westminster Abbey, the Houses of Parliament and St Paul’s Cathedral, providing students with a deeper insight into the landmarks and their links with Shakespeare himself. All content displayed during the roughly 120-min tour is linked directly to the National Curriculum for Key Stages 2 and 3, whilst providing interactive LOtC. The tours are available for booking on various dates throughout term times. Teachers can benefit from a free ticket when accompanying a school group. Shakespeare’s London has been developed in conjunction with the Shakespeare Birthplace Trust, Shakespearian scholars and Golden Tours, to allow students to experience London as the poet himself would have done. Schools looking to book the tour should contact the schools’ team on 0207 3416 256 or email schools@goldentours.com. For more information, visit www.goldentours.com/school-trips.